What we discovered was a repeated activity with no clear link to gaining food or status – it could be a ritual. On the other hand, it could be more symbolic than that – and more reminiscent of our own past. Marking pathways and territories with signposts such as piles of rocks is an important step in human history. 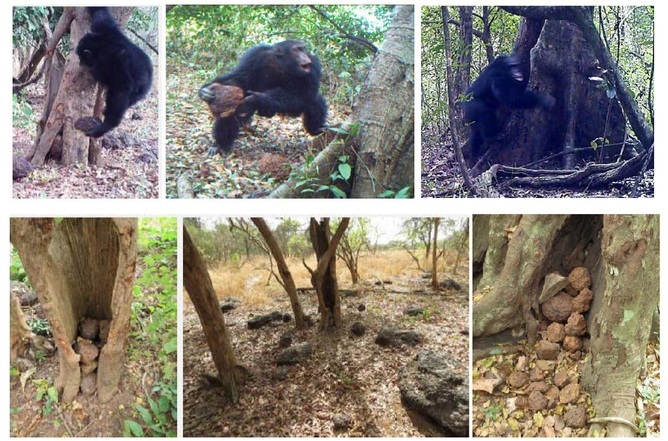 Figuring out where chimps' territories are in relation to rock throwing sites could give us insights into whether this is the case here. Adult male tossing, hurling and banging a stone; stones accumulated in a hollow tree; typical stone throwing site; and stones in between large roots. Image: Author provided. To unravel the mysteries of our closest living relatives, we must make space for them in the wild. In the Ivory Coast alone, chimpanzee populations have decreased by more than 90 per cent in the past 17 years. › Is Simon McBurney’s The Encounter the future of theatre?